My love of Etsy is no secret as it is such a marvelous place for handmade artisans to share their work with everyone around the world! I have put together a blog post describing some of my Etsy favourites from the past year, and I have personally worked with or own these items, so I am excited to share them with you! I have had such a blast working with big stitch unspun wool roving since the summer as it is such a hot trend right now! I was thrilled to discover a supplier for the North American market who happens to live in my hometown! 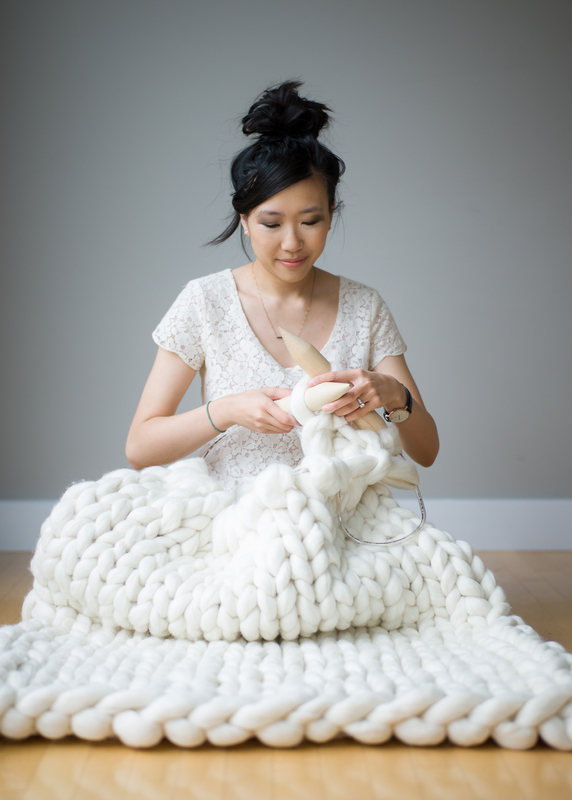 Sarah of Mama Knows Luxury sells this big stitch wool that is amazingly soft and luxurious. In the picture below, I am holding 1 lb of mint and 1 kg of salmon (see the rest of my haul HERE)! This gorgeous wool comes in a wide variety of colours! In order to work with such jumbo wool, Sarah designed this lightweight 40 mm crochet hook made of poplar! They are handmade in Beaumont, Alberta by MD Handfield Designs Inc, exclusively for Sarah’s shop Mama Knows Luxury. What a thrill it is to dabble in extreme crocheting with this beautiful tool! You can also check out these Premium Extreme Circular Knitting Needles that Sarah recently designed and added to her shop too! I had always wanted to try my hand at extreme knitting, and I was given the chance to work with 3 kg of undyed cream 100% merino wool from Sarah’s shop to knit a blanket! I had so much fun and enjoyed every step of the process. I used great care not to pull too tightly and to work with even tension. The process was not as difficult as I was expecting it to be, and I LOVE my finished blanket. You can find my full blog post and FREE PATTERN for this Extreme Knitted Blanket HERE! Here is a video of me working with Sarah’s merino wool so you can see it in action! Using my 1 kg of salmon 100% merino wool and 40 mm crochet hook, I designed this Extreme Crocheted Rug! You can find the free pattern for it HERE! Using my 1 lb of mint merino wool and 40 mm crochet hook, I designed this Extreme Crocheted Cushion! You can find the FREE PATTERN and step-by-step tutorial for it HERE! Aren’t those stitches gorgeous? I also had the pleasure of collaborating with a local indie dyer and spinner named Allison Barnes a couple of months ago! I described what colour palette I was looking for, and Allison created this gorgeous blend of blush pink, dove grey, and white. Below is the result of our collaboration: “Blush Bloom“, a super bulky thick and thin merino wool! 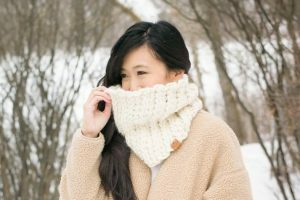 I used this stunning wool to knit myself a Thick and Thin Cowl! I just adore the size variation of the stitches to create such beautiful texture. You can read my full blog post about this cowl and get the free pattern HERE! I love wearing this cowl now it’s getting quite chilly here! I attended the Etsy market a couple of months ago and discovered some new handmade artists, including Lindsay of Haiku Lane Vintage Jewelry! I adore the Ear Jacket Earrings I’m wearing in the picture below and I always get compliments whenever I wear them (find a variety of them in Lindsay’s shop HERE)! They are so gorgeous and unique! You can use the code “HAIKULOVE” to get FREE SHIPPING on your orders (until December 10) so you can snag yourself a pair or as a special gift for a loved one! I am also wearing my “Jumbo Puff Stitch Cowl” that I blogged about last year HERE! As knitters and crocheters, we have many tools that we need to use, including hooks and needles, stitch markers, scissors, and measuring tapes. Chantal of Knitatude has created these trendy knit kits as a practical way to hold all our tools! Check out what comes in these kits HERE and see what clever phrases Chantal has come up with too (some of them are pretty cheeky)- I myself own the “Knitters Gonna Knit” pouch! I love the gold stork scissors! Chantal says she has come crochet pouches in the works for us crocheters too! One of my goals this year was to learn how to fair isle knit! Here I am proudly wearing one of my Fair Isle Knitted Hats that I’ll be blogging about soon! I used Kathleen of Country Pine Designs‘ pattern called “The Colorado” that you can find on Etsy HERE! I love that mustard colour! I’ve been such a big fan of the crafting mother-daughter duo behind the Etsy store Bubbles & Bongo, and I even featured them in a previous Craft Chat HERE! Erinna and Rosemary combine knitting, crocheting, and sewing to create stunning dolls. 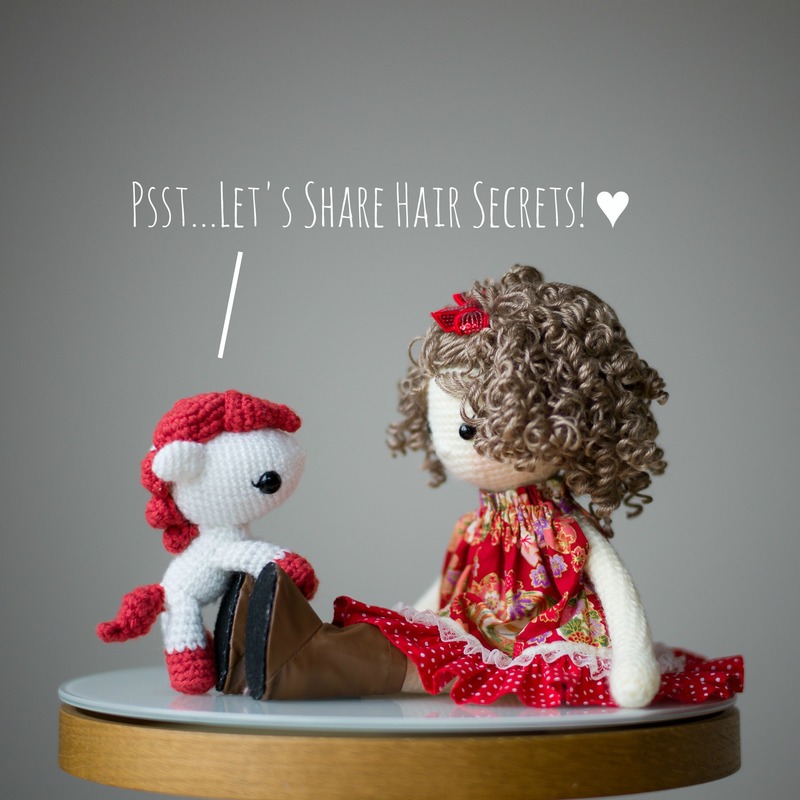 Below you’ll see one of their handmade dolls with gorgeous curly locks chatting away with my Chinese New Year Pony! Their doll is crocheted with a handsewn fabric dress and adorable boots. Check out all the dolls in their store HERE! In addition to selling finished dolls, Erinna also sells her crochet amigurumi patterns! They are very well-written with clear explanations, and below is an example of one of her newest designs: the Nutcracker Doodahs! I just they think they are so incredibly adorable and perfect for Christmas! I have so many fond memories of watching the Nutcracker growing up, and Doodas are such a whimsical and cute design! They would make perfect Christmas decorations or dolls for our little ones! Check out the pattern for these cutie pies HERE in their Etsy store and the rest of her patterns HERE! I am so honoured to be the proud owner of this doll who bears a resemblance to me! She has black hair, a side ponytail and loves to wear long tunics with leggings (my go-to outfit haha). Here you can see an example of a handsewn fabric doll crafted by Rosemary with a gorgeous knitted tunic adorned with a cute crocheted lamb face on it. It’s amazing how they combine so many different arts to create their beautiful dolls! Take a peek at more of their handmade cloth dolls available in their Etsy shop HERE! 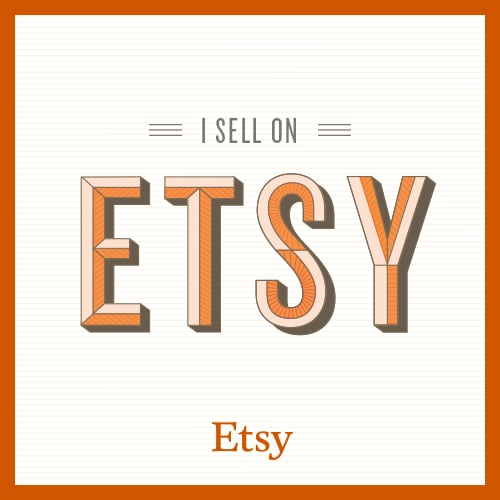 I hope you enjoyed reading about all these Etsy products that I’ve loved! Each and every artist is passionate about what they do and it is evident in their handiwork and customer service. Big stitch wool is definitely an investment and something to save up for, and I know that it is on the Christmas wish list of many! The knit kits are perfect for knitters, and the earrings are such a unique jewelry piece that make a statement. The crocheted and handsewn dolls are beautiful works of art that will be cherished for years to come, and if you love to crochet amigurumi, you can create your own Christmas amigurumi such as the Nutcracker Doodas as well. I truly love all these items and hope you do too! Feel free to share this post and pass it on as a hint to your potential gifters! Be sure to also check out the Etsy Editors’ Picks HERE to discover more fabulous handmade talent! Note: This post is sponsored by Etsy. All Etsy links are affiliate links, and all opinions expressed are 100% my own!